Ibrahim Tanko has good reason to be proud of his career. 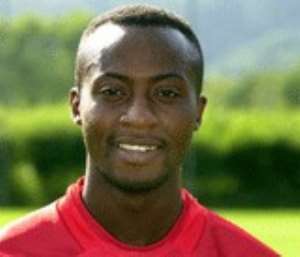 He left King Faisal in his native Ghana to debut with Borussia Dortmund in the 1994/1995 season –with only 17 years and 61 days, making him the second youngest player ever in the Bundesliga. And while injuries kept him sidelined more than he would have liked, things went pretty well for the player, as he bagged two German first division titles and a Champions League winner's medal with the Westphalia outfit. Since touching down at Freiburg at the beginning of the 2000/2001 campaign, the challenge has been to keep up the battle against injury and prove his worth in a side struggling to remain in the top flight. After ten years in the Bundesliga and as he approaches his 27th birthday, Tanko says there are still mountains left to climb and that his main objective now is to use his strength in attack to see Ghana through to their debut in the mother of all sporting competitions. FIFAworldcup.com spoke with the African star before Saturday´s qualification match against Uganda in Kampala. Despite some extraordinary footballers - Abedi Pele and Anthony Yeboah, to name just two -, Ghana have never qualified for the FIFA World Cup. Why this time? This time, we have a young team and the important thing is that we're precisely that, a team, a unit, and not just a collection of individual players, as we've been in the past. We showed what we're capable of against South Africa (3-0). I think Ghana will make it to Germany. Burkina Faso, Cape Verde Islands, Uganda and South Africa. At first glance, it looks like the South Africans are the side to beat for Ghana in Group 2. What do you think? You only have to look at what's happening in Euro 2004 to realise that there's not much to choose between international sides these days. And if you analyse our group, you'll see that every team has won at home and notched up three points. We beat South Africa 3-0, but we lost 1-0 away to Burkina Faso. What I'm trying to say is that this is going to go right down to the wire. We're away to Uganda next, which is our chance to prove that Ghana are strong on the road too. Do the people of Ghana see themselves at the FIFA World Cup You could say that people in Ghana can´t wait for the World Cup. They have gone crazy over here. Some of us were lucky enough to be at the preliminary draw in Frankfurt and to tell you the truth, a lot were asking when we'd be back. People think that we can do it this time, and so do I. Freiburg isn't a World Cup venue, but playing in the Westfalenstadion in Dortmund would be fantastic. Who are your five African contenders for the FIFA World Cup? I could mention Cameroon, Senegal, Nigeria and Egypt, but there's a long way to go and I think it's a bit early to be making predictions. I haven't seen much of Tunisia, who are the current African champions, and you have watch out for sides like as Côte d'Ivoire, who have won their first two games. Freiburg is a very friendly city, with a distinguished university, but in football terms, how would you define the fans? Freiburg fans have stuck by us through thick and thin, and it's something we really appreciate.